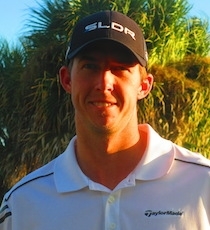 PALM CITY, Fla. – Brant Peaper of Tequesta, FL, was the winner Thursday at Martin Downs Golf Club in a playoff between two players who were both looking for their first victory on the Minor League Golf Tour. Peaper birdied the second extra hole, the par-4 12th, from a foot and a half, to outlast Ryan Snouffer, Sparta, NJ, after they tied at four under par 67. They had halved the par-3 11th and Snouffer missed a 15 foot birdie attempt at 12. In regulation, Peaper bogeyed the second hole, turned in 36, birdied Nos. 12, 13 and 16, then closed with an eagle at the par-5 17th. Snouffer had six birdies between bogeys at the first and 18th holes. Peaper earned $720, Snouffer $570, from the $3,510 purse. Peaper received another $177 from an optional bonus pool for a total of $897. The MLGT’s 33rd tournament of the year drew 26 starters. April opens next week with three 18-hole events: Monday, Parkland CC; Wednesday, Palm Beach Par 3 GC; and Thursday, Jupiter CC.